The evolution of the web from Web 1.0 to Web 2.0 and now to Web 3.0 can be used a metaphor of how education should also be evolving, as a movement based on the evolution from Education 1.0 to Education 3.0. I discussed this in Schools are doing Education 1.0; talking about doing Education 2.0; when they should be planning and implementing Education 3.0. Many educators are doing Education 1.0; talking about doing Education 2.0; when they should be planning and implementing Education 3.0. This post compares the developments of the Internet-Web to those of education. The Internet has become an integral thread of the tapestries of most societies throughout the globe. The web influences people’s way of thinking, doing and being; and people influence the development and content of the web. The Internet of today has become a huge picture window and portal into human perceptions, thinking, and behavior. Logically, then, it would seem that schools would follow suit in mimicking what is happening via the Internet to assist children and youth to function, learn, work, and play in a healthy, interactive, and pro-social manner in their societies-at-large. Most schools are still living within and functioning through an Education 1.0 model. They are focusing on an essentialist-based curriculum with related ways of teaching and testing. Similar to Web 2.0, Education 2.0 includes more interaction between the teacher and student; student to student; and student to content/expert. Some educators have moved into a more connected, creative Education 2.0 through using cooperative learning, global learning projects, shared wikis, blogs and other social networking in the classroom. Education 3.0 is a connectivist, heutagogical approach to teaching and learning. The teachers, learners, networks, connections, media, resources, tools create a a unique entity that has the potential to meet individual learners’, educators’, and even societal needs. Many resources for Education 3.0 are literally freely available for the taking. Taking this one step further or from another angle, moving from Education 1.0 to Education 3.0 can be compared to moving from Pedagogy/Essentialism/Instructivism to Heutagogy/Constructivism/Connectivism. 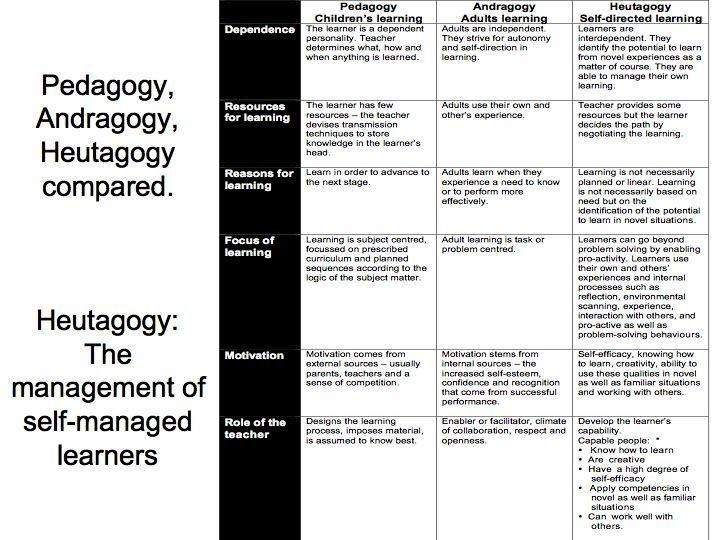 This can be looked at as a continuum going from Pedagogy to Andragogy to Heutagogy (PAH). The following graphic describes these three approaches to teaching. (I understand that educators may differ in the descriptions and definitions especially that of pedagogy). This translates into moving from an education approach driven by essentialism or instructivism to one that is based on constructivism and connectivism. These descriptions fit the characteristics of an Education 1.0 or a traditional pedagogical teaching framework. The andragogical, more constructivist orientation takes on the characteristics of Education or Web 2.0 where the principles of active, experiential, authentic, relevant, socially-networked learning experiences are built into the class or course structure. The heutagogical, connectivist orientation is closely aligned with Education 3.0. Even though heutagogy is usually defined and described for adult learners, given these times where we are living with open education resources and information abundance, learners as young as the elementary level have the potential to engage in educational experiences based on heutagogy. In other words, they can engage in self-determined and self-driven learning where they are not only deciding the direction of their learning journey but they can also produce content that adds value and worth to the related content area or field of study. It should not be as simple as stating that one, as an educator, uses one teaching orientation over another. Educators need to examine what they are teaching and the population to whom they are teaching. For example, procedural knowledge such as how to do first aid or fix a car; or a fixed body of knowledge such as human anatomy (for the medical field) or the study of law is typically best taught through a more teacher directed, “pedagogical” style. It becomes teaching with intentionality and strategically using the teaching and learning philosophies and approaches to reach desired outcomes. As stated above, though, there are cases in which a body of knowledge needs to be learned by the students. Some more engaging, interactive apps are available (and probably more interesting) to the learner. Examples include: Solar Walk™ – 3D Solar System model, Frog Dissection, and highly interactive eBooks. The following presentation demonstrates project-based learning with mobile devices in a High School Science class. Use technology in more transformative ways, such as participatory and collaborative interactions and for higher-level teaching and learning that is engaging and relevant to students’ lives and future plans. Use technology more to extend learning beyond the classroom. Determine what they want to learn and develop their own learning objectives for their learning, based on a broad range of desired course outcomes. Use their own mobile learning devices and technologies to decide how they will learn. Form their own learning communities possibly using social networking tools suggested and/or set up by the educator. Possible networks, many with corresponding apps, include: Facebook, Twitter, Edmodo, Instagram, Blogging sites, Youtube, etc. Utilize the expertise of the educator and other members of their learning communities to suggest and introduce content-related resources. Utilize the expertise of the educator and other members of their learning communities to suggest Web 2.0 and other online tools for that the students could possibly use to demonstrate and produce learning artifacts. Demonstrate their learning through methods and means that work best for them. It could include using their mobile devices to Blog, create Photo Essays, do Screencasts, make Videos or Podcasts, draw, sing, dance, etc. Take the initiative to seek feedback from the instructor and their peers. It is their choice to utilize that feedback or not. Developing a broad array of possible course assignments from which a learner can choose. See the DS106 Assignment Bank as an example. Additional suggestions can be found in 20 strategies for learner interactions in mobile #MOOC. Here is a slide deck that I prepared to present the concepts and ideas I presented above. Are you referring Education 3.0 to young learners? I agree with a lot of statements, intentions, terminology both in the classroom and outside the classroom, the web and so on. However, when a student is not given a path of choices made in conjunction to his or her needs/interests/educational level/reading ability he or she will have a very hard time inventing one. Today’s students are computer savvy and perhaps some or most of their inventions should be computer based. However, they still need to read, write and do math. How are they going to describe what they invent in writing? How are they going to write instructions for others to read about their inventions? Certainly, some arithmetic will be involved! Fortunately, without knowing your concepts I guess I successfully taught Education 3 to my art students for eternity. Of course the subject is challenging and the possibilities infinite and diverse, so it was easy for all of us. Their numerous meritorious awards speak volumes. Their teacher however accommodated the student and vice versa not to mention that most of the time we were working together on any given project. No two pieces were ever alike. They loved working with groups and their teacher in particular. The reason I mention the above is that I have actually run many “experiments” on that topic of doing something of their own interest. I would give them a free week, they will call the topics they wanted to work on and after all the supplies were accommodated for, the time would come for them to commit to whatever they thought interested them. All topics were written on the board which they could add take away, work in the classroom alone with groups, at home with industry, with other peers etc. To my surprise they could not do it. They wanted objectives and certainly steps on how to go about it. I would give individualized ones and encouraged them to create and teach us the process. Either I was not introducing it properly or the kids liked my methodology where I accepted their own application of the goals presented to them. I’m guessing the latter. And I thought I would make a small note! Thanks for your comment, Poppy. Two points that you made that I’d like to comment upon. First, as you noted young learners need some basic skills – reading and writing, for example. I totally agree and discuss this in selecting Your Teaching Orientation section – where I state that ones teaching orientation is dependent are the desired outcomes and the population with which the educator is working. Second, you mention the difficulty you had with your “experiments”. We have to be cognizant of the fact that our learners are coming from similar Education 1.0/pedagogical paradigms. I did similar “experiments” with pre-service teachers. They were resistant but with a little guidance and once they got the hang of all of the choices provided to them, most loved this model of learning. Thanks for the discourse, Poppy! I thoroughly enjoyed this post. I thought you spoke directly to the evolution of education with a true focus on what the college and career oriented curriculum in schools today should become. It would appear that the generations of students who are tech savvy are expected to be technologically oriented professional, not only in the work that they produce but to produce it on the move. Mobility has completely transformed the ways in which we conceive life as we know it. I can’t help but refer the concept of the knowmad society (http://www.knowmadsociety.com) that has been put forth, where employment will be entirely nomadic. So it would be only right that education would follow suit and start exposing students to the plethora of resources that are available to be productive academically and civically. Thanks for your comment – I hadn’t thought of “Mobility has completely transformed the ways in which we conceive life as we know it.” It is a great point! My heutagogical footsteps keep bringing me back to your blog. This is my favorite post on “User Generated Education”. You continue to inspire and educate me. Thank you Dr. Gerstein. Thanks, Robert – very appreciated! Thank you for a hugely intriguing, exciting and exhilarating article on Heutagogy. I look forward to this theme developing. Innovation is the key to learning. Your discussion is stimulating in that too often the education system is, “the dead culture laying its trip on you!” the Internet and technology in the hands of individuals changes the learning field. My sense is that there needs to be a moderator to guide the learning-interest to insure that what is learned can be accurate and useful. Thanks for the astute observation and sharing of all possibilities. I have been researching heutagogy for the last six months when I came across your blog. Wow, you have captured so much and explained it so well. I will be referring to your blog during a presentation I am giving later this month. Hi Jackie. “Wow!” indeed. I am about to commence my Ed.D. and my research topic centres on lifelong learning as it relates to 21st century education and especially to self-directed and self-detrmined learning as essential for career development. I came across the McKeown table long ago but, strangely, not come across your fantastic site. I do love your Education 1-3 metaphor as it really hits the mark. I believe Connectivism deserves more attention as a learning theory or paradigm for the 21st century learning and that a social constructivist approach is essential for effective learning. You will not be surprised to know I am an advocate for the 70:20:10 framework and, of course, Action Learning (good old Reg Revans nailed it long ago).. It is a shame that many of our educational institutions and workplaces (with ‘training departments’), are still anchored to instructivist beliefs and the working-learning nexus (LEARNING BY DOING) remains alien. I hope my research contributes positively to change this mindset so learners can learn optimally in the 21st century. Thank you for your contribution.